The University Library at Heriot-Watt is very well used throughout the year and this semester the footfall and occupancy has increased. Although there are study spaces on all four floors of the library, we have reached the situation where it is often at capacity. It is a good position to be in i.e. students using the space and resources but it is not so good when students can't find space to work. So we have a campaign to 'Make the Most of the Space'. 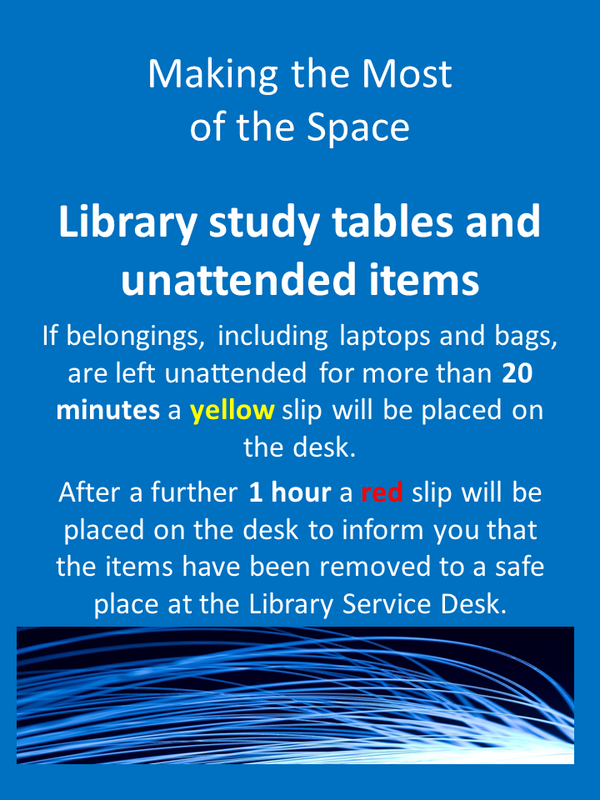 This involves two main strands - firstly, changing the floor zones and noise levels and secondly, monitoring the study spaces for unoccupied spaces with unattended items. Neither of these are easy to manage but it is essential to do so otherwise we are not optimising the resource that we have. So the second one first. Monitoring the study spaces. 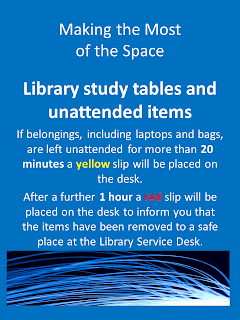 We have that very common issue in university libraries when students want to reserve a study space by leaving items on a particular desk then going off to a lecture or for a meal and then returning to the space. In an ideal world this would be reasonable as it would be convenient to have a 'spot' where you could leave your papers and books and then come and go. But it is not fair when there are a limited number of spaces and we have had quite a few students complaining that they can't find a space to study. So we introduced a system whereby we check around the library and make a note of any spaces that have belongings but are unattended, then 20 minutes later, on the second tour round a yellow slip is placed on the table explaining that the study spaces are in high demand and that belongings must be removed in order to enable other students to use the space. The yellow slip is timed and states that in an hour the belongings will be taken to the service desk for safe keeping. After at least an hour, the yellow slipped desks are revisited and a red slip placed on the desk. It states the time that the table has not been in use i.e. from the first tour to the red slip time which will be at least 1 hour 20 minutes although probably more in practice. Two members of staff remove the belongings into a marked crate. A slip is filled in detailing all the items that are removed. The crate is marked with the time the items were removed and taken to the Service desk and stored in a secure place. When students come to collect their items, they sign a receipt for the items. As you can see there is a lot of time and effort involved in the whole process. We have been doing this for 2 weeks and we have this week to go. The process happens 3 times a day - once in the morning, once in the afternoon and once in the evening. We have quite a large team and so it is split between everyone so that people rarely have to do it more than once a week. The good thing is that it has been successful - we have addressed the concerns by some students that they can't find a space to study. We have been in the situation where we have cleared a desk and a student has been hovering waiting to use it. We have not had any complaints from students who have had their items removed - they have all been perfectly reasonable and accepting of the situation. It has acted as a deterrent which is difficult but I think most people think it is fair and realise that if they are going to go for more than 1.5 hours then they can't reserve the space. It is time consuming, sit's not a particularly popular task and it is possible to see it as being a typical 'library checking up and telling off' thing but it is possible and important to be positive about it. When I have been doing the monitoring I have noticed that it is possible to ask students if they know who is sitting on the next place and if they've been away for long etc. It's not a perfect system and students do realise that we only monitor at certain intervals but that is ok - we are not doing it to try to catch people out. In an ideal world it would be self policing but in reality it isn't, so we are helping to maintain and manage the space the best we can on behalf of the students. (We did liaise with the Student Union and also with Security before implementing the campaign. There is also an aspect of raising awareness of leaving unattended items and the security risk involved in doing so). Managing a team is challenging. Managing a first line customer service facility/function/dept is demanding. All of these are also rewarding and satisfying when they work well and are successful. Today it is six months since I started my job as Customer Services Manager - managing a team of 33 who deliver first line Information Services and Library support - through various changes and developments. We have successful delivered these services but I'm aware that there is still lots more to do before we are the 'perfect' team. I'm trying to be tactical and use the experience I've got to find solutions. I'm spending lots of time talking to people - to discuss and understand their views and collaborate and listen. I'm getting involved - leading by example by doing the things I'm asking others to do. I'm standing back and looking at the change process to see where I am, others are and the team is. I'm accepting that there are ups and downs but we will get there.